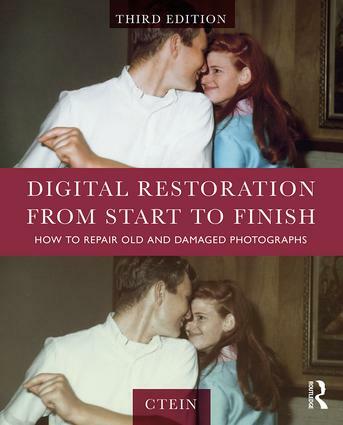 Digital restoration recovers and restores a photograph to its proper glory while leaving the original object unaffected. 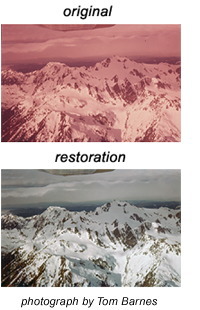 It usually produces much greater improvements in image quality than conventional physical photo restoration. 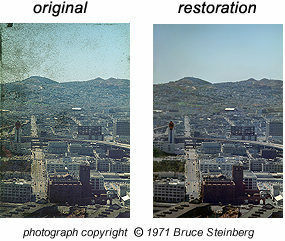 Digital restoration does not involve physical alteration of the original photograph. All the restorative work takes place in the computer. There's little risk of damage to the original, unlike with physical restoration. I can restore almost any type of original photograph — color and B&W; slides, negatives, and prints; sheet film, roll film, and glass plates. After digital restoration, you'll receive high-resolution (typically 80-100 MB) image files of your restored photograph, suitable for printing. I will also send a high-quality print of your restored photograph. I return your original to you, unharmed and unaltered, with the print. I retain a copy of the restored file as insurance against loss or damage in the future. You can get complete information about my service by reading the "order services" and "questions & answers" pages linked to the buttons at the top of the page. Click on the images above to see some examples of my restorations.